This article is about demonstrating the definition of motion detection and explaining the theoretical background of camera side motion detection. For the viewer side motion detection implementation please visit our How to setup viewer side motion detection in C# page. What is a Motion Detector? A motion detector is a device that detects moving objects, particularly people and motion detection is the concept of detecting moving object on a video image. The detector is often integrated as a component of the system that automatically performs a task or alerts a user to the motion in an area. Motion detection is widely used in domestic and commercial applications. One common everyday application is activation of automatic door openers in businesses or in security systems of public buildings. This is a great solution if your camera device does not support motion detection directly on the device. In this case you need to detect motions on the software side with some image processing algorythms. 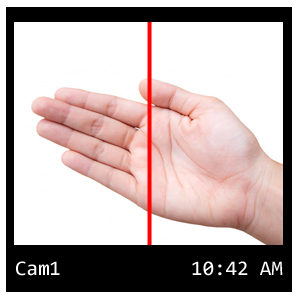 OZEKI Camera SDK gives you great solution for detecting motion detections on the viewer side. It is useful when you do not want to use the most of your CPU to image processing. Instead you can subscribe on the motion detection of the Onvif camera (if it is supported). An average camera contains many events that a user can subscribe on. One of them is the motion detection event which occures when a motion is detected in the camera image or in a specified ROI. The camera is able to detect the motion with it's sensors. If the event occurs the user is notified and can react as he/she wishes.